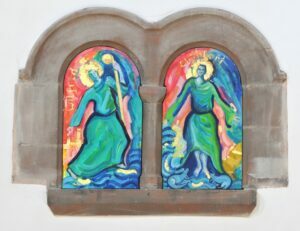 Former students at the Hostel of the Resurrection in Leeds, which closed in 1976, raised money for 2 small painted doors which enclose the former double piscina in the Resurrection Chapel. The paintings are by Lorraine Lamond of Glasgow. St Wilfrid is striving heavenwards, while pointing to a shimmering representation of the Hostel, while St Cuthbert is coming from the sea, having his feet dried by otters. Behind St Cuthbert the Community’s collection of Saints’ relics is kept in a strongbox. These are fragments of St Cuthbert’s Coffin and relics of St Jean Vianney, St Machutus, The Blessed Marcellini Champagnat, and the Blessed Gabriella of the Community of Vitorchiano, with whom we have an ecumenical partnership – an unusual collection! The paintings are full of life and joy, and bring a splash of colour to that simple space.